There is a line of 20 destroyed caravans and 7 destroyed motorhomes then the intact one you can see pushed out into the middle is ours. It's still in being checked but so far the damage seems mostly cosmetic (smashed drivers cab window from where the fire engine broke in to get the handbrake off plus some panel damage from them pushing it into another van), plus some heat damage (mostly to trim) at the rear corner. 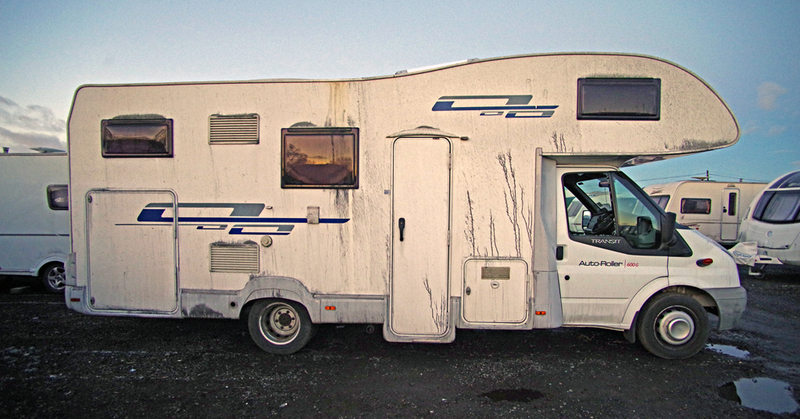 Still waiting to hear if the motorhome parts will be available to get it fixed completely but I'm told it could be a few months before it's sorted out. Bloody Hell !!!!! Sorry to hear about this horrible news. I take it the place where you stored it have the Insurance liability that will cover the cost of all the repairs to your van ? Do you know the cause of the fire ? I hope that everyone who looks at this devastating photograph will now realise why there are rules on UK Club Campsites regarding the spacing of pitches between camping Units ? Sorry to use your unfortunate circumstances to raise this issue but it shows exactly the devastation that can be caused by fire, let alone the threat to life, and in minutes !! Currently it's our own insurance that are covering it. I don't think the storage place's insurance will be involved but it's possible my insurance company will claim against whoever's vehicles was the cause - although it's not clear if that will be determined. By the time it was spotted there were 4 vehicles ablaze, but not sure they can narrow it any further than that. It's supposed to be a condition of storing there that all the vehicles have insurance but it sounds like at least 3 of the caravans didn't (including one that was worth over £20K). Will be interesting to see what happens with them - especially if one of them turns out to be the cause! There is at least £400K of damage and could easily be more. The spacing points is a good one - I've certainly seen continental sites, Aire's and wild camping places where the vehicles are no further apart than the vehicles in our storage place were. Apparently there were all sorts of explosions and the flames could be seen for miles. Just as well ours didn't catch light as well, as we had 24kg of gas as well as a full tank of fuel in the van and generator! Given the damage mostly appears to be cosmetic I think it'll be use-able again with just the drivers door window replaced as it seems to still be watertight. Pretty much all the plastics on that side have melted to some extent though, along with the rear side window and the back window - which have both buckled slightly. I am not sure about every Insurance companies policies, but certainly Comfort state that you need to inform them when, if not in use for more than 48 hours, if you are storing your van at a location different to which is specified on the policy. I know a lot of people that I have talked to didn't even know whether this was a stipulation in their policy or not !! Another 'way out' of 'paying out' for the Insurers if you don't read the stipulations in your policy and comply with them. 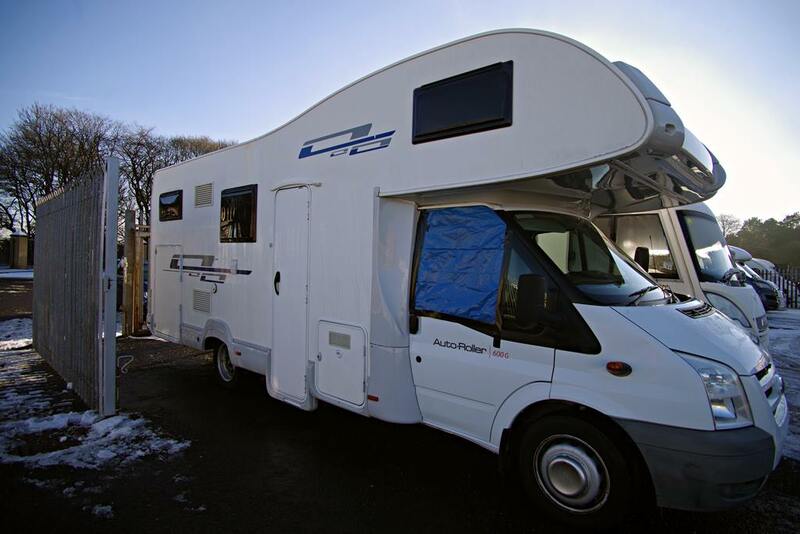 We've stored our motorhomes here for more than a decade (and still will!) and have always made sure to let the insurance folks know. With it being a CaSSOA gold site it's actually cheaper to insure with that as the storage address than it as at home (give most motorhome thefts seem to be from outside the owners houses). It is most definitely a good idea to make sure there isn't any way an insurance company could avoid paying out! We've never been asked to fit any additional security (although we have a steering lock in case we think we need it) although I've seen folks who store theirs at home say they've been asked to. I even have heard some say they've had extra security fitted when they don't - which is asking for trouble. I think that it sometimes depends on the value of the vehicle, some insurers will ask for Alarms and Trackers to be fitted. Comfort do not 'insist' on such things, however, they provide good discounts on premiums for any 'approved' security enhancements that are fitted by quality approved professionals. When I had my alarm system completely replaced on my old van, I was provided with a certificate by the person who installed it, giving all the details of the system fitted, this was sent to my Insurers, I retained a copy and the installer retained a copy which served as a 'guarantee'. We were down to under £200 to insure ours without any additional security - although sadly that is going to change. We currently have insurance on 7 vehicles so despite the fire not being our fault, just having to make a claim is going to add a fair bit to our annual insurance bill even if they do find someone to claim against.